Since the birth of our second son, my wife and I have considered purchasing an SUV to accommodate an extra person and all of the additional stuff we haul around with us. It’s been a struggle for us as there are so many great SUV’s currently on the market. 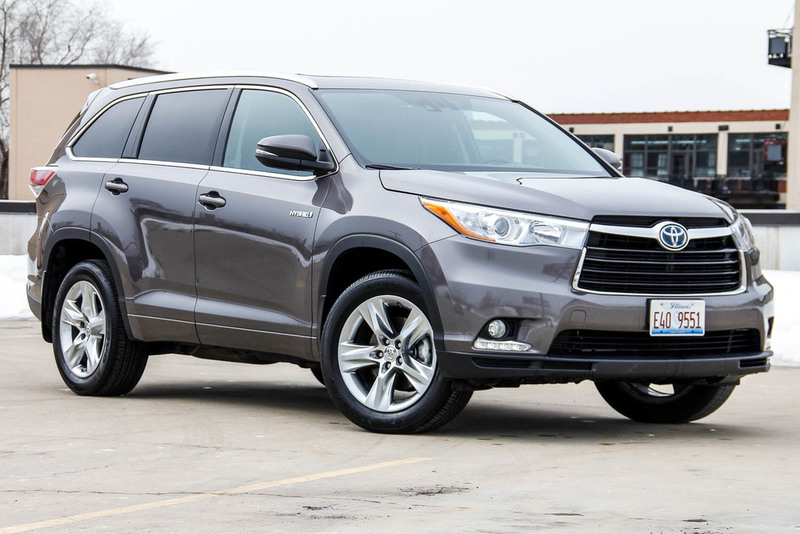 The new 2015 Toyota Highlander Hybrid has made the struggle even harder, as we found this to be an excellent vehicle to throw into the running. Most of you know by now that we live in Chicago, where side roads are small and parking is pretty much a nightmare. We are fortunate to have a garage, but we always need to consider the size of the vehicle as the bigger it is, the harder it is to find parking and maneuver around narrow streets. We had the opportunity to spend some time with the Highlander, which opened our eyes to a model that we had only briefly considered before. This vehicle impressed us on all levels, especially with the miles per gallon. I had a hard time believing that a hybrid would work the way I expect on a vehicle of the Highlander’s size. We currently own a hybrid sedan and we love it, so it was exciting to be able to test out how a hybrid SUV would actually perform. Would we get the gas mileage we hope for and still have the capacity to tow jet skis or a small boat? Would we still have all of the room we desire without feeling like we’ve given up power? After spending a week with the vehicle, I have no doubt that the answer to both of these questions is a resounding yes. The Highlander hybrid, which was first available in 2010 and received a facelift in 2013, has been increasing in popularity every year. It is considered a mid-size SUV, but it’s a bit on the larger side, which I noticed and personally enjoyed. As the exterior goes, I’ve always found Toyota to be great in offering a very attractive SUV. The Highlander has a very clean and conservative appearance. The wrap around HID projector headlights give it a clean look and complement the good sized front grill. The fog lights are low and towards the end of the bumper. The body looks to have good clearance and will tackle the harsh Chicago winters with beefy tires on 19” rims. 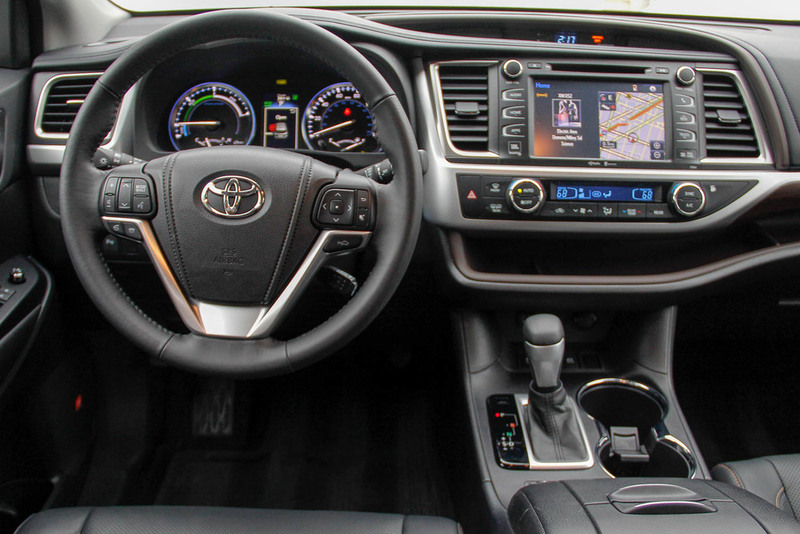 The interior appears similar to the rest of the Toyota line-up. Nothing too elaborate but very attractive. It’s a really clean and subtle look with lots of room to store items. The dash is very open and all of the controls are easy to navigate. The large touch screen monitor at times felt too sensitive, but I think it’s just a learning curve to overcome. I really liked the small 3 inch gap below the dual climate controls where you can store cell phones, sunglasses, pens and pretty much anything small that you need within reach. The center console is wide with plenty of room in the storage compartment to fit a small laptop. Toyota really took care in making sure there was sufficient room and storage since many people would likely use this as a family vehicle. Visibility is good sitting in the driver’s seat, but I could see the big hood becoming a sight problem for shorter drivers. One surprise feature that I enjoyed was the flip down curved mirror, which let me keep an eye on the two kids in the back. The back seating area is pretty big. I am able to fit back there comfortably without the front passengers having to sacrifice leg room. The big test was installing our massive baby seats and it was a breeze. There was still plenty of room with them in, and honestly room to spare. This vehicle is also equipped with 3rd row seating. I usually find it difficult trying to get to the 3rd row, but not in this case. The back seat are captain’s chairs with open space between them, making it convenient to get back there. You also have separate climate controls for the rear, which are easy to access right behind the center console. I’ve always thought of a SUV as a vehicle with a tough engine to provide enough power to hold its own. I never thought a hybrid motor would work, but the Highlander proved me wrong. As technology has gotten better, so has efficiency. Yes, this is a hybrid, but also has a 3.5-liter V6 and an electric motor to produce 280hp along with a 3,500lb towing capacity. So this answers my question as to having enough power to tow. The more I drove the Highlander, the more I liked it. Driving in downtown Chicago, I was averaging 24mpg. This is a little below the advertised 27mpg, but I was also driving in a congested area with constant stop and go traffic. It was really smooth but I did find an obvious transition going from electric to motor. Those not used to a hybrid would notice it more but I expected it and didn’t think of it as a big deal. This was an AWD model, and the instant torque from being a hybrid really added to the performance. I drove it on the highway as well, and enjoyed a smooth ride averaging the suggested 28mpg. Overall I really enjoyed the vehicle. At first I didn’t know if I would like it, but both my wife and I ended the test period really considering purchasing this model. It has everything we need to accommodate our growing family, not to mention it drove very nice and comfortable. Yes, it’s slightly on the bigger side but it’s not bad at all. I didn’t have any problems maneuvering around town. My 4 year old loved the panoramic roof and rear captain’s chairs, and the three zone automatic climate control really made it convenient for everyone to stay comfortable throughout the entire cabin. The Highlander starts out at $29,990 and the Hybrid at $47,870. The increase in price for the hybrid model does pay off in the long run with the good gas mileage. Other models I have tested in its class averaged about 6-8 mpg less. The fully loaded model we tested retails at $52,042. I’d like to thank Toyota for the opportunity to spend some time with this model and make our decision when it comes to purchasing an SUV that much harder. Please visit your local Toyota Dealership for more information.